Markets so far this year remind me of two years ago when I wrote the article January Effect, Shrinkflation, Gold & Uranium. After strong gains in 2012, followed by a roaring 2013 which saw the S&P 500 +29.6%, NASDAQ +38.3% and DJIA +26.5% to 16,576.66 at year's end, it wasn't much of a surprise to see January 2014 pull back and end at it's low for the month at 15,698.85 -5.3%. That January Effect called for a flat to down year; instead the Dow bottomed at 15,372.80 going into February but by December was over 18k for the first time and ended 2014 at 17,823.07 +7.5%. Last year the Dow was -3.7% in January and did end 2015 down overall at 17,425.03 -2.2%. While this market predictor has an impressive long-term track record going back to 1940 and seems to work better during rising rather than falling Januaries, it hasn't worked as well lately. Then again this hasn't been a typical 4-year bull market but instead has lasted 7-years as of this March, so far. Maybe dips are just bought faster today by rational algo-trading computer programs instead of staying down longer or falling further as a result of people overreacting mainly on greed and fear impulses. For what it's worth the Dow ended January at 16,466.30 -5.5%—similar to 2014 which later broke all-time highs. The point is that from the January Effect to the Super Bowl Indicator to the Presidential Cycle, I'm more interested in why a predictor should work again rather than what happened before. I still believe it all boils down to Fed actions that move the M2 ever higher with so many trillions of liquidity pumped into the financial system as ZIRP debt that stock markets could only go higher. The problem is happening now as these returns eventually diminish and falter while the debt remains. After several quarters of bluffing, the interest rate Boogiewoman's poker hand was finally called in December—to preserve credibility the Fed raised rates a quarter point. It's hard to believe the carnage seen in global markets last month was the result as rates were 0% to 0.25% before the bump. If this was the cause then how can a forecasted 1.375% occur this year as the rate didn't really change yet? The Fed has painted everyone into a dangerous Keynesian corner. Other than stock market gains and more part-time jobs, where is the inflation threatening economic boom that warrants higher interest rates? They do need to tighten, if for no other reason than to be able to ease rates again going into the next recession but this should have happened sooner as doing so now may provoke its timing. The Fed needs this arrow back in its stimulus quiver but must worry about the fallout of even slight US rate hikes on history's largest debtor nation. Debt is supposed to be reduced during boon times as budget surpluses occur; instead government fiscal deficits persist and debt keeps growing. The result is that instead of financial engineering smoothing out boom and bust cycles, volatility gets worse. It is unknown how much debt will represent the exact tipping point when confidence in the dollar is lost, but governments and the Fed seem determined to find out. Overspending continues to be our kids problem as we blindly presume these debts will forever rollover in our own currency. China's insatiable demand growth for oil, gold and other commodities, combined with its foreign reserves now over $4 trillion, could provide the leverage for prices to also be set in their own money. As USD demand falls its value could spiral down even faster if holders of US debt start to demand renewal payment terms in their own fiat scrip—USD checkmate regardless of how many get printed. In the ongoing currency race to the bottom, Japan's savers now have the same dilemma as most of Europe with negative interest rates. It's China's turn to devalue but this is unlikely until after the US election and by then the Yuan / Renminbi will have officially joined the USD, Euro, Yen and Pound as IMF SDR's. 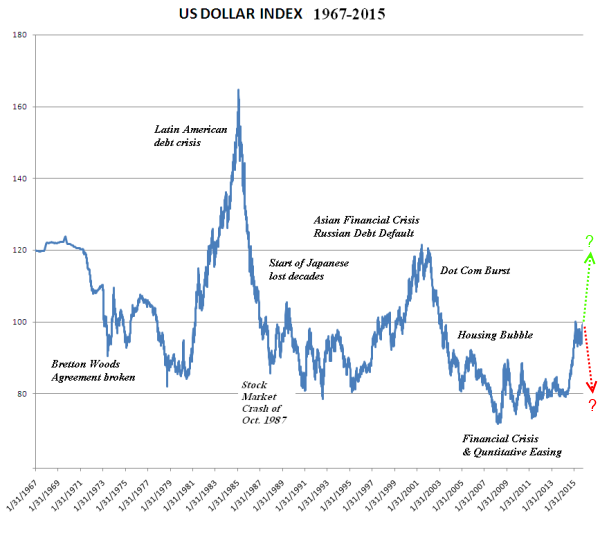 King dollar and its veto still dominates the world's reserve currencies but for how long? Many blame last month's worldwide stock market rout on China's expected growth dropping to 6.5%. I'm only partially convinced as exports to China represent very little of US GDP which supposedly is in good times with rising interest rates but barely 2% growth. And I don't buy the argument of starting from a smaller base anymore as China has surpassed Japan as the world's second largest economy. China is having overcapacity growing pains but is still in an enviable position with excess reserves to stimulate. Over 70% of our economy depends on credit stretched consumers, so why should China even worry about exports with more than a billion citizens yet to convert into eager shoppers. The lower oil excuse also makes little sense. Markets are forward looking which implies lower energy costs for everything. Unless you produce oil this is good, not bad for the economy. Lower energy costs improve profit margins and consumers get meaningful extra discretionary income to spend. Saudi Arabia is blamed for crashing oil prices to kill the fracking industry but I'm sure the lower energy costs positive stimulus effect on the economy is not lost on the government or the Fed. Fracking will come back as oil prices rebound so I doubt the Saudi's came up with the idea of giving up billions of revenue in the meantime all on their own. Then again dramatically lower oil prices also hurts Iran whose oil is coming back on stream and pressures Russia's economy. Many speculate the Saudi's were influenced into lowering oil prices in the 1980's as the real reason the Cold War ended. Instability favours gold and I believe the US dollar is headed lower, but the hard part is figuring out the short-term as the USD is still the least dirty rag in the currency hamper. The USD Index remains high at ~100 with reasons to go either way this year. Much depends on whether the US economy jumps as past QE programs with lower energy prices stimuli finally trickle down to main street—holding the dollar and stock markets together at least until election season is over. Higher interest rates usually strengthen a currency which make imports cheaper, although exports are hurt as they cost buyers more. The trade deficit shows the US still buys over $40 billion a month more than it sells, so this appears to be another net benefit to the majority of US voters. On the other hand our stock markets and the USD can be affected by any number of negative political events which could rekindle economic fires from China, Russia and the Middle East to Europe's PIIGS countries. As for US politics both parties mismanage debt. However over the past three decades we have seen two major bull markets from 1995-2000 and 2009-present both started under democratic presidents, with three US stock market crashes started under republican presidents in 1987, 2001 and 2008. Call this coincidence if you want but wars are costly with both Iraq wars starting under republicans and ending under democrats with 1998-2001 being the only years going back to 1969 with a US budget surplus. How many wars would Bush have avoided today in Syria, Egypt, Libya, North Korea, Ukraine and Iran? Superstitious investors are likely cheering the Panthers and voting Billary. Precious metals, energy and most commodity prices tend to be inversely correlated with the USD. I'm still gradually buying producing gold, silver and uranium mining stocks on dips so I'd be interested in your opinion on where the USD is headed from its apparent 100 pivot point on the chart below? For my contrarian value investing style, how I currently look at gold market risks, why I am buying producing mining stocks instead of bullion going into the next gold cycle, see Part I and Part II. (NYSE:ABX)(TSX:ABX) Barrick Gold is a major producer mentioned in Part I at $7.51, now $9.25, and (TSX:PRU)(OTCBB:PMNXF) Perseus Mining, (AMEX:BAA)(TSX:BAA) Banro Corp. and (AMEX:TGD)(TSX:TMM) Timmins Gold are penny stock mid-tier producers detailed in Part II. On January 21, Barrick reported in line preliminary 2015 full-year production of 6.12 million ounces of gold and 511 million pounds of copper. ABX continues to deleverage its balance sheet having met its $3 billion or 24% debt reduction target but indicates Q4 results on February 17 will show ~$3 billion in impairment charges on goodwill, Pascua-Lama and Pueblo Viejo. I'm still just watching. Perseus' January 27 Activity Report shows full-year production and cost guidance to June 30, 2016 of 172k-192k ounces of gold at all-in costs of US$1,130-US$1,250 per ounce. PRU has been profitable as expenses are paid and reported in Australian dollars while gold is sold in USD, plus they still have over 120K ounces sold forward at US$1,276 or ~A$1,800. PRU's P/E is less than two but trades under C$0.30 for the first time in months as they deal with expected temporary issues as operations move to higher grade pits. PRU also prudently delayed the full-scale construction decision for its Ivory Coast mine until gold prices rise, preserving its cash and bullion now at A$99 million plus A$35 million in hedges. PRU has millions of ounces and an operating mine in Ghana with no debt, which the market ignores as C$154 million in market cap is less than its A$165 million in working capital alone. Banro's two producing gold mines are in the Democratic Republic of Congo with two more waiting to be developed. BAA still trades at US$0.18 even as full-year production met guidance of over 183k ounces. Twangiza's production was +38%, exceeding guidance again at over 135k ounces. BAA's November 11 Q3 shows record EBITDA of $20.3 million +46% and $54 million YTD +118%, with lower cash costs of $501 per ounce at Twangiza. The big news is that commercial production was just declared at Namoya, which produced ~16k ounces last quarter and is expected to produce 9k-10k ounces per month at full capacity. More big news is that a strategic Chinese mining group is expected to soon close US$98.75 million in an equity private placement, a term loan facility, and a gold stream. Timmins has been a disappointment and is down but not out. I wrote that TGD indicated a significant impairment charge was coming—to me that means 20%-30%. TGD's Q3 instead reported a whopping $226.5 million write-down, around 80% of assets. Also, TGD's San Fransisco mine will stop open-pit operations mid this year, effectively turning it back into a developer after they process the ore on the heap-leach pads by this time next year, unless gold prices rise. However even after these blows TGD's balance sheet still shows ~$100 million in shareholders equity with a market cap of only $42 million at US$0.13 per share. I liked the November 12 Ana Paula infill drill results of 122 meters of 4.45 g/t Au and 88 meters of 7.14 g/t Au, but not that it took a month to renew TGD's yearend loan of $10.2 million or the share price hit until then. I may still add on dips as I still think TGD is in play. Next week I'm going into some of the larger undervalued gold producers I have liked for a long time, but which I have held off buying or writing about in hopes they were near breaking key technical support levels and would become significantly more undervalued. I thought this could happen in December during tax loss selling season but it did not. However, even though gold prices so far this year have only trended higher, with the global stock market sell-off last month a few of these gold stocks finally cracked and bounced off of new lows without any specific company reason I can find.